Figure 1. 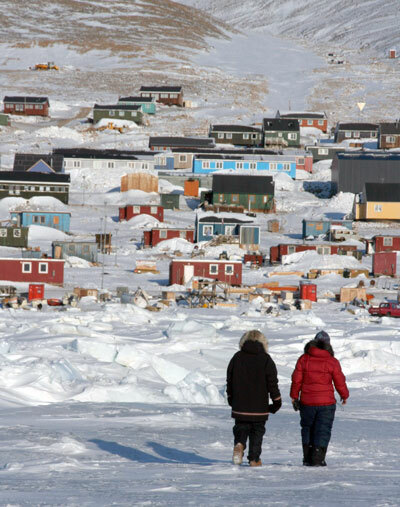 The village of Qannaaq, Greenland, in the Arctic, is built on permafrost. Figure 2. Engineers had to invent special techniques to build the Qinghai-Xizang railroad in China on ground that stays frozen all year long. Frozen ground can affect people's lives. When it thaws, it can damage buildings and transportation. When all the water near the surface is frozen into ice, it can make finding drinking water for towns difficult. Many people worldwide live in places with seasonally frozen ground. Hundreds of thousands of people in Alaska, Canada, and Russia live on permafrost (Figure 1). What is it like to live with frozen ground? One place that has a lot of permafrost is the Tibetan Plateau in southwestern China. 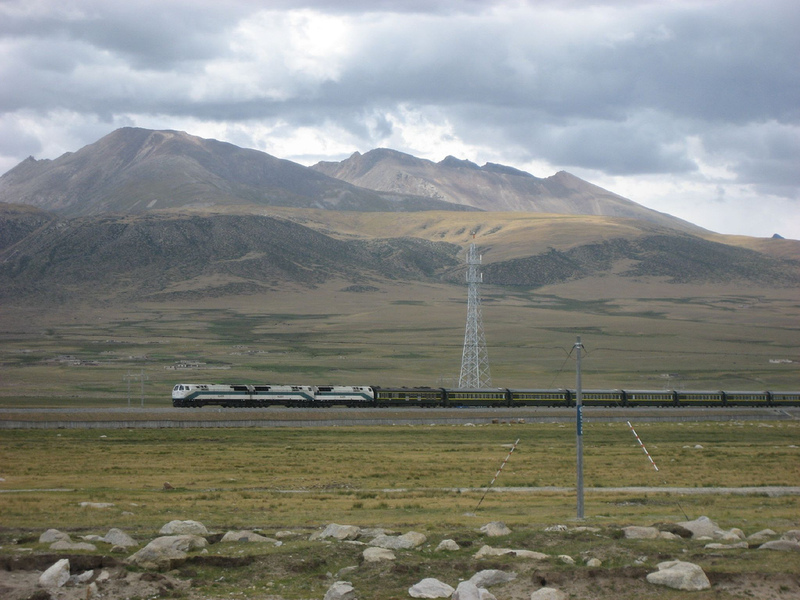 People have to cross the plateau to travel between cities in Tibet and other major cities in China. The high altitude of the plateau makes travel difficult. It is cold and the air is thin and hard to breathe. It is very hard to build a road under these conditions, so the roads are poor. The only way to get to some parts of the Tibetan Plateau was to fly. The Chinese government wanted to to build a railroad to make travel cheaper and easier. In 2007, the railroad opened. 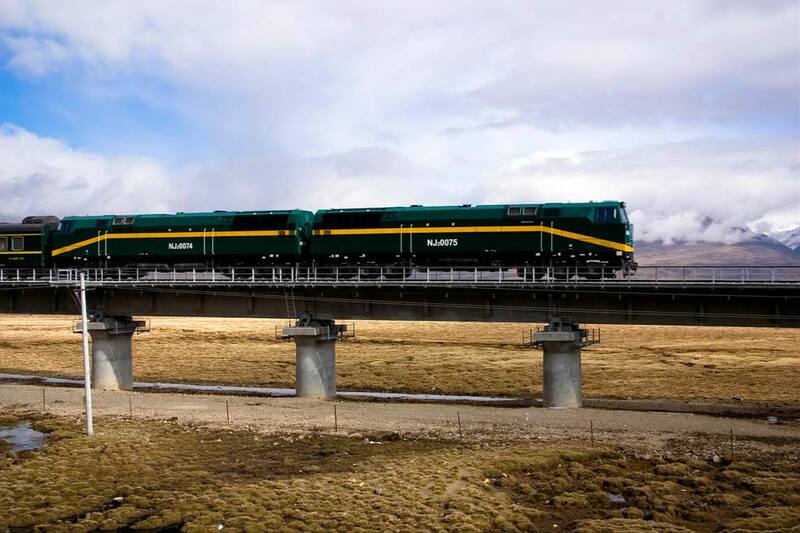 For the first time, people could take a train between Lhasa, the capital city of Tibet, and the rest of China. The railroad stretches 1,100 kilometers (684 miles), nearly the distance between New York City and Chicago. Designing and building the railroad was difficult because it had to cross permafrost. Building and running a railroad could create heat that would thaw the permafrost. Scientists also see evidence that Earth's climate will get warmer and cause the frozen ground to thaw. If the frozen ground thawed, it would become soft and uneven, and the track would buckle. Scientists who study frozen ground helped the railroad's engineers figure out how to solve the problems of building on permafrost. To make sure that the ground stayed frozen, Chinese engineers used special techniques. They used crushed rock to insulate the ground, and built high bridges to keep the train tracks above the permafrost (Figure 2). How does frozen ground affect buildings? Constructing lasting buildings on frozen ground is difficult. Huge layers of ice can grow underground and thicken over time. When ice forms underground, it expands. This can make the ground move, causing frost heave. Frost heave lifts up the ground, as well as everything on top of it. Building on permafrost is also challenging. Buildings that are heated from the inside give off heat. The heat can thaw the permafrost underneath the building. 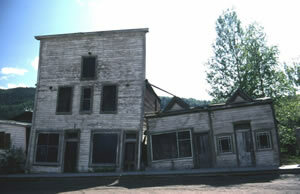 Once the permafrost thaws, it sinks, damaging the building it supports (Figure 3). Engineers sometimes solve this problem by preventing the ground under the building from getting warm. They put the building on top of a steel frame, a few feet above the ground, so cold air can flow under the house. The cold air stops the permafrost from thawing. Another way to stop damage from thawing permafrost is to thaw the ground first. This method makes the ground more stable to build on. Then there is no danger of the ground beneath the new structure refreezing, because the structure keeps the ground from freezing. How does frozen ground affect water supplies? In areas with seasonally frozen ground, finding water in the winter is not that difficult. Ground water under the surface usually does not freeze. Plus, lakes, rivers, and reservoirs can provide water, too. Permafrost, however, is more difficult to deal with. Most of the ground water is frozen, and any water that is liquid may not taste good. The ice in the soil pushes its minerals out. These minerals get concentrated in any liquid water in the soil, affecting the taste of the water. In places of discontinuous permafrost, people do find water. They drill through areas of unfrozen ground to get to ground water. In places with large, continuous stretches of permafrost, finding water takes a lot of effort. People can sometimes get water from nearby lakes and rivers or by melting ice or snow, but they cannot get liquid water directly out of the ground in the winter. 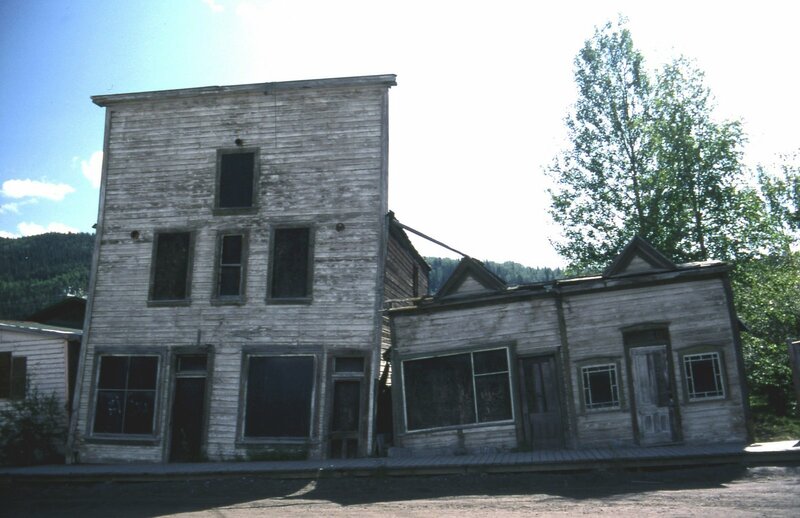 In some places with a lot of permafrost, towns build water pipes from the water supply to the buildings. However, the pipes have to be protected so that water inside the pipe does not freeze, and so that the ground around the pipe does not thaw. Sometimes, engineers avoid this problem by building protected pipes above ground. They use pillars to keep the pipes up off the ground. This helps stop damage from freezing and thawing ground. Figure 4. 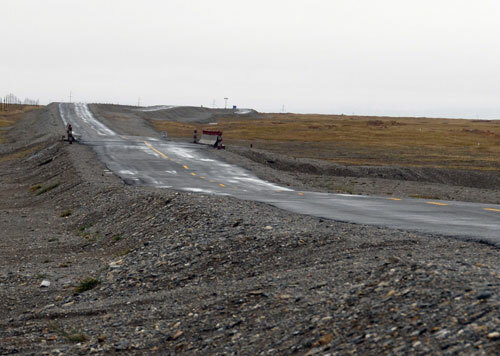 Uneven thawing damaged this road in Tibet. Figure 5. Engineers elevated sections of the Alaska Pipeline so that the warm oil did not thaw the permafrost. In the distance, the pipeline is buried in the ground where permafrost does not exist. How does permafrost affect transportation? Roads, bridges, railroads, and other types of transportation infrastructure sometimes cross frozen ground and permafrost. If the ground thaws unevenly, it can cause damage. Some roads might need constant repairs to keep them safe (Figure 4). Sometimes the effects of frozen ground can be unexpected. For example, during the winter of 1950 near Fairbanks, Alaska, the active layer of ground froze under a bridge. Frost heave caused the ground to expand around the footings of the bridge. Part of the bridge was lifted up, creating a sharp bump in the tracks. A train passed over the uplifted bridge, and the train's cars came disconnected from the engine. The engine kept going because the conductor was unaware of what had happened until he came to the next town, 60 miles away. The people on the train also didn't know what had happened, and they wondered why the train had stopped so long. They were getting cold because the engine was providing heat to the car they were riding in. Finally, the engine came back to get them, and they then realized what had happened. Engineers have several ways to stop road damage. Engineers sometimes replace soil under roads with gravel so that water drains better and there is less frost heave. Experts recommend painting roads white to reflect more heat and keep them cooler. A cooler road surface helps prevent frozen ground from thawing underneath. In some places with permafrost, the top layer of the ground thaws during the summer, but the water does not drain away. These wet areas are too marshy for roads. To solve this problem, people only drive on these areas during the winter. Engineers build ice roads on top of the frozen marshes. The ice on the roads is at least 100 centimeters (about 40 inches) thick. Trucks weighing up to 64 metric tones (70 tons) can drive across and haul supplies to mines and drill sites in northern Canada and Alaska. Ice roads are also built on frozen lakes for winter travel. In summer, the roads melt and must be rebuilt each winter. How does permafrost affect oil and natural gas? Alaska, Canada, and Russia all have important fuels that give our cities, towns, and farms energy. Getting oil and natural gas out of the ground and to the people who use it is a huge effort. Drilling deep wells for oil and gas can thaw permafrost. If the permafrost thaws, the wells can collapse. Drilling companies put their equipment on special concrete pads built to prevent the ground underneath from thawing. Cement well liners prevent wells from collapsing. Companies also use special drilling liquids that do not freeze as quickly as water does to lubricate the drill bits. Once the oil or gas is out of the ground, companies need to move it to where it will be used. In 1977, oil companies built the Alaska Pipeline. 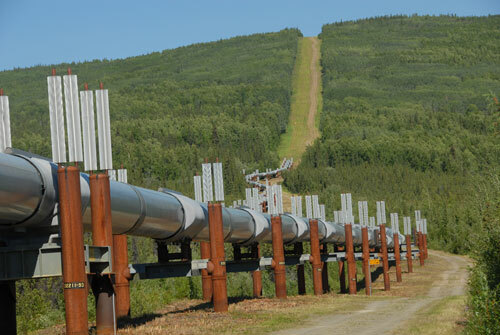 The pipeline takes oil 1,299 kilometers (800 miles) through Alaska to the shipping port of Valdez. Building the Alaska Pipeline across permafrost was difficult. Oil in the pipeline must be kept above 60° Celsius (140° Fahrenheit) so that it flows easily. The oil would be warm enough to thaw the permafrost and cause the pipeline to sink and break, so engineers built the pipeline above the ground in many places. In Figure 5, the pipeline is above ground where it runs over permafrost. The pipeline can run underground in sections that go through seasonally frozen ground. They also constructed devices to put the extra heat into the air rather than letting it go into the ground.